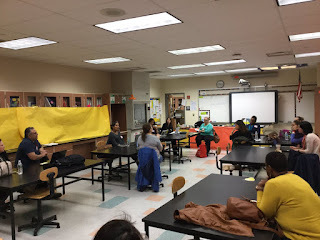 I attended an outstanding professional development conference today at West New York Middle School called Edcamp Urban. The organizers, Krista Welz (@kristawelz), Marcos Navas (@mrnavas), Bibiana Prada (@bookgirl614) and Dan Borghoff (@EdTechMaker) did an amazing job feeding us, getting our questions and comments addressed via the session board, reminding us that the "room" is the expert at an unconference like this one (as opposed to any one participant) and providing us with inspiring, motivating and encouraging conversations, methodologies and tools. Oh and there was lots of free stuff, too! Below, I've summarized some of the most useful tips, tools or methods that came up. 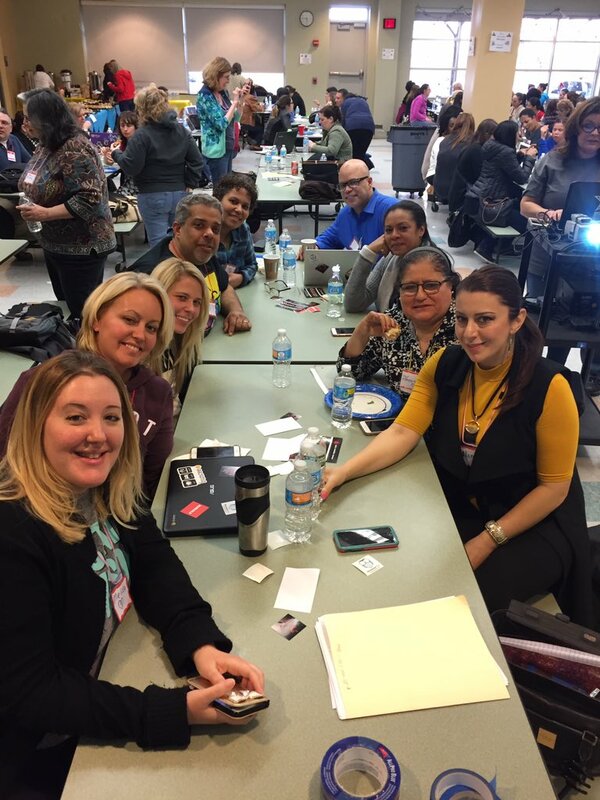 However, I also want to stress how easy it was to meet and collaborate with so many other educators, and how positive the overall vibe was. I have rarely been in such a productive and friendly PD environment! Challenges in Urban Classrooms: Try Mindmapping Tools to Boost Writing Skills! An English teacher mentioned that her native-Spanish-speaking students often write exactly the way they would speak Spanish out loud, but are oblivious to it even when asked to read their own text back to themselves. As a former World Language teacher, this dilemma sounded incredibly familiar to me. My students would often write German the exact way they would speak English and insist it made sense when it didn't. I had a lot of success with mindmapping tools like spiderscribe.net or mindmeister.com, where students could see the writing process as a visual concept that had clear components like an introduction, coherent paragraphs and conclusions. They could additionally break their writing down on the sentence level with these tools and examine word order, vocabulary and grammatical concepts and then share the work with peers and/or me to get feedback. Using spiderscribe.net, I was able to increase one class' writing average from about a 50% to about a 75% over the course of a few months. Teachers in this session easily provided a list of effective ed tech tools that can be used to create engaging learning experiences outside of the classroom. One teacher mentioned Peardeck, an interactive slideshow tool, while others raved about EDPuzzle, StudyJams and BrainPOP. As in any Flipped Classroom discussion I've experienced, there were some teachers who could not get their students to do the homework necessary to participate in related activities in class. In some cases, the group suggested integrating student choice with creative marketing methods, such as framing a quest for the perfect flashcard app as a chance to play on smartphones. Or encouraging students to surf YouTube to find fun, effective lessons on verb conjugations, which they could then load into a common repository and assign to themselves for homework that night. But what if all else fails and even the most engaging ideas can't entice them to do the homework--a critical element of Flipped Classroom methodology? Don't give in and assume that you have to teach them what they should have done on their own the night before. The fact that you can't proceed with your lesson as planned is not your problem; it's theirs. Make them solve it. Ask the students pull up the homework they didn't do and formulate a plan, on the spot, to teach you what they should have learned. Have a rubric ready for this--it's a test grade. Then sit back and watch them apply interpretive skills, collaboration skills and critical thinking skills in an effort to learn the material and apply it on their own time. This way, they learn most of what you were aiming to accomplish with them anyway, and more than likely are motivated to avoid unannounced test grades in the future by simply doing the homework next time. Marcos Navas presented Design Theory to about ten of us at the end of the day. I had heard of it before but not really completely understood how to apply it. However, Marcos' demonstration was inspiring. In Design Theory, students are encouraged to empathize with an individual (i.e. "character") who has a problem, and then form ideas and prototypes that might solve the dilemma. The process requires several 21st Century Skills, including collaborative and critical thinking skills, and has, in some cases, resulted in young people coming up with ideas that were recognized by big companies or corporations. The Extraordinaires Design Studio PRO set made me realize how much Design Theory could revolutionize higher ed, where professors often rely far too much on traditional, yet passive and ineffective teaching methods like lectures. We could, for example, create our own Design Studio PRO set for a doctoral program in education, with "characters" such as a typical K12 student, a K12 teacher in an urban school, a K12 parent, etc. and "props" like the PARCC test, a technologically rich classroom or a bullying incident, and then have graduate students empathize with their "characters" and work together to solve authentic problems in education. In many cases, this could inspire doctoral theses or further research on these topics. At the end of the Design Theory session, Paul Umrichin (@gurupaulu) casually showed us his Rocketbook Wave notebook, which he uses to handwrite notes that can then be saved from within the notebook itself as PDF files that sync to a cloud platform (e.g. Google Drive) and/or be accessed via a QR code on each page. Notes can be erased by filling a cup of water, placing it on the notebook and microwaving it for a few seconds. Wait, WHAT?! Yeah, that was our reaction too. We had to ask Paul to repeat all that and explain it again. Not only does this thing actually exist, it's only twenty-seven dollars. Unbelievable. I ordered one on the spot, and I think a few other participants planned to get one as soon as possible. This tool will revolutionize the way I take notes, organize myself and share with others even more than I've already been doing on collaborative platforms like Google Drive. I cannot wait to get mine in the mail! Thanks to Krista Welz, Marcos Navas, Bibiana Prada, Dan Borghoff, Paul Umrichin and so many others who made Edcamp Urban a truly wonderful learning experience today.